I have three glazes in my little garage studio: Chun Red, Heather Green (I can't recall the exact name of the glaze, but this sounds about right), and a new one - Antique Iron. We (this includes myself and my kiln-master husband) just mixed the Antique Iron and this will be our first time firing with it. I have no idea how this glaze behaves, so I took care not to put it on too thickly and Joe used all the tiles that were available to catch any runs. The sample tile for Antique Iron is a teal color, but looking at other potters' results online, it might break brown, red or teal. This leaves me eagerly awaiting the results tomorrow evening. 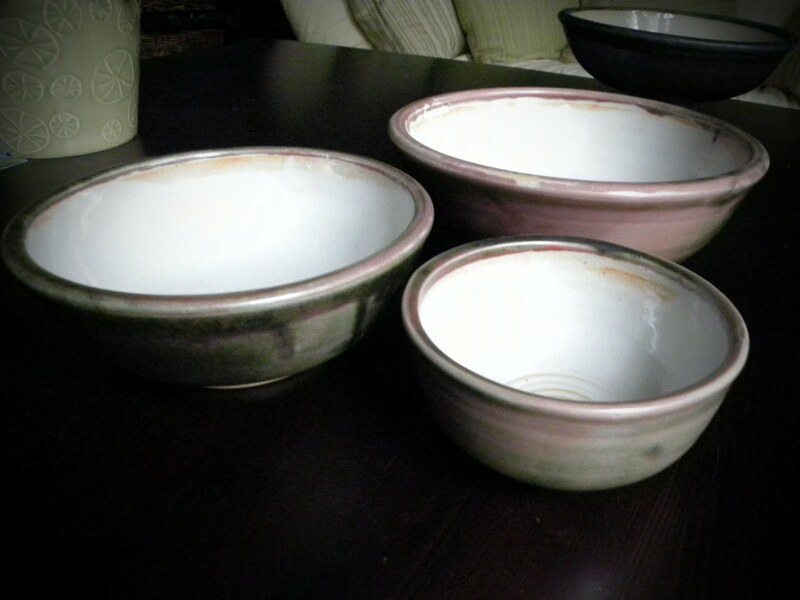 This afternoon I went by the Crafts Center to pick up three finished bowls, glaze several plates, and take one vase back to be bisque fired. I ended up tossing one plate because there was an s-crack on the bottom, but there were still four left, and for the most part, they match. Because I still have so much to learn and experiment with, I feel like I still haven't developed a body of work from a common form. Experimentation is fun and good, even if it means my pieces go together more like the Jolie-Pitt family than the John and Kate plus 8 family. This is probably a common feeling, but my expectations of myself are always just a bit higher than my skill level and results. In other news, I was accepted to the Handmade Market which will take place at Marbles Kids Museum on November 7th. When I applied, I don't think I was really aware of how soon November 7th would creep up on me! Joe has been more than accommodating in helping me plan my booth and try and get my pots fired in time, and he has certainly earned his title, "Kiln Master". I took part in the very first Handmade Market back in May 2006 helping coordinate the charity raffle and then sold some of my wares at their second event that November. This is a fun group of people and I look forward to doing it again! Congrats on the Handmade Market I will be there supporting all my crafty friends! hey, that's awesome news, paige. i was hoping to make it out to the handmade market but we may be celebrating eric's birthday at the zoo that day. if i do make it, i want to check out your wares.